Every year for the past twelve years a NOAA sponsored report has been issued on how the arctic region is faring environmentally. The peer reviewed report brings together the work of scores of scientists from across the world to report on air, ocean, land and ecosystem changes in the Far North. It is a key tool used around the world to track changes in the Arctic and how those changes may affect communities, businesses, and people. The report was released in December at the annual American Geophysical Union fall meeting. •	Warmer air temperature. Average annual air temperature over land was the second highest after 2016 in the observational record, with a temperature 2.9 degrees Fahrenheit (1.6 Celsius) above the average for 1981 to 2010. •	Declining sea ice. This year’s maximum winter sea ice area, measured each March, was the lowest ever observed, while this year’s minimum area, measured each September, was eighth-lowest on record. Sea ice is also getting thinner each year, with year-old ice comprising 79 percent of coverage, and multi-year ice just 21 percent. In 1985, multi-year ice accounted for 45 percent of sea ice. •	Above average ocean temperature. Sea surface temperatures in August 2017 were 7.2 degrees Fahrenheit (4 Celsius) above the average in the Barents and Chukchi seas. Surface waters of the Chukchi Sea have warmed 1.26 degrees Fahrenheit (0.7 Celsius) per decade since 1982. •	Arctic ocean plankton blooms increasing. Springtime melting and retreating sea ice which allows sunlight to reach the upper layers of the ocean, continues to stimulate increased chlorophyll as measured by satellite, which indicates more marine plant growth across the Arctic. This increase has occurred since measurements began in 2003. •	Greener tundra. Overall vegetation, including plants getting bigger and leafier, and shrubs and trees taking over grassland or tundra, increased across the Arctic in 2015 and 2016, as measured by satellite. The greatest increases over the last three decades are occurring on the North Slope of Alaska, Canada’s tundra and Taimyr Peninsula of Siberia. The annual report on vegetation is based largely on data from sensors aboard NOAA weather satellites. •	Snow cover up in Asia, down in North America. For the 11th year in the past 12, snow cover in the North American Arctic was below average, with communities experiencing earlier snow melt. The Eurasian part of the Arctic saw above average snow cover extent in 2017, the first time that’s happened since 2005. 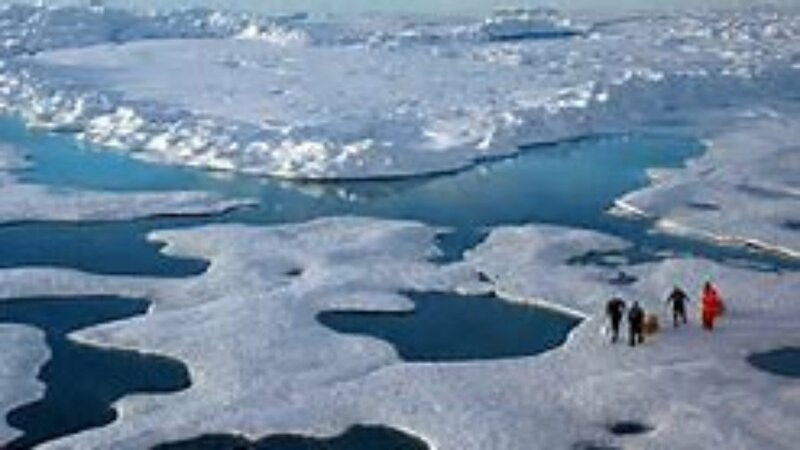 •	Less melt on Greenland Ice Sheet. Melting began early on the Greenland Ice Sheet in 2017, but slowed during a cooler summer, resulting in below-average melting when compared to the previous nine years. Overall, the Greenland Ice Sheet, a major contributor to sea level rise, continued to lose mass this past year, as it has since 2002 when measurements began.